Who is Tutsi? Who is Hutu? Who knows? Who wants to know? And in any event, how can one know? Imagine a British girl reading political science at Oxford who writes a rather mediocre thesis on a ‘Truth and reconciliation commission in Zimbabwe’. Her thesis is marked with a ‘pass’, but upon graduation she walks into McKinsey Consult as a partner to manage a hefty World Bank contract to develop… the Truth and Reconciliation Commission for Zimbabwe. The good young lady applies her ready-made thesis. The results are disastrous for Zimbabwe while she goes on to lead a successful career as an expert on Africa. There is something pernicious in being an Africa expert as a profession. Over time, many experts develop a ‘theory of change’ which they in turn sell to the World Bank, ‘donors’, universities and media. As they frequently encounter an unconventional African country, they refuse to register, at times subliminally, realities that negates their selling pitch – their bread and butter. We Rwandans sadly aren’t spared. Yet, having understood this, it all generally amuses us until it is April, when we can’t take a joke - and the joker. So it is April again. And I would like to go through typical jokes – or rather insensitivities, which seem to sell as western expertise. The title of a documentary film a few years ago and the theme of a television series ‘Black Earth Rising’ currently airing – both produced by the British Broadcasting Corporation (BBC), is also the title of a book: ‘In Praise of Blood’ by a Canadian journalist, Judy Rever. The theory implies that Tutsi did - or are doing ‘unrevealed harm’ to Hutu, and therefore, as Helen C Epstein puts it in the Guardian; Hutus were ‘justified to revenge’. The theory, which is nothing but ‘accusation in mirror’ was advanced by Gregoire Kayibanda in a long speech in front of the entire diplomatic corps on 11thApril 1964, in then Gitarama Stadium, after he had just massacred all the Tutsi from the Gikongoro region who made up between 40 and 50% of the population there. Kayibanda essentially said that Hutus faced Genocide at the hand of Tutsi and therefore Hutus were justified to commit ‘preemptive genocide’ against the Tutsi. No country has ever been developed by aid. A country is developed by tourism, manufacturing, agriculture and usually funded by private sector and Foreign Direct Investment (FDI). Rwanda’s FDI is attracted by a consistently high ranking on the ‘Ease of Doing Business’ by World Bank and ‘Transparency International’s Corruption Index’, testifying of a conducive business environment, and little or no corruption. 30 per cent of Rwanda’s GDP comes from tourism and conferences; illustrated by the two African Union Summits held in Kigali two years ago, the Commonwealth Heads of Government Meeting (CHOGM) to be held in Rwanda next year and the Africa CEO Forum – the most important business event on the continent which attracted over 1800 delegates just last month. I am told the organizers envision bringing it back next year, given the standards at which Rwandans delivered. Now these things do not happen out of pity, nor does economic growth. There are many countries that suffered tragedies which do not score 8% back to back annual growth for a solid ten years. The theory that Rwanda sells the genocide, alongside the theory that Rwanda lives off the looting of minerals in DRC were advanced by NGOs. Ironically, Rwanda is the country that has phased out the most NGOs both locally and especially in refugee camps in eastern DRC, where most of the above mentioned experts used to work and were put out of business...it must therefore be a case of sour grapes. Even in monarchical times, the king was asked to give up his Tutsi affiliation before acceding to the throne, as the oath went: ‘wari umututsi witwaga Rudahigwa, none ubaye umwami uzitwa Mutara.’ (You were a Tutsi and your name was Rudahigwa, now you are a King, you shall be known as Mutara). Marriages across ethnic lines weren’t rare, even the king could offer his daughter or sister in marriage to other tribes, clans etc. President Kagame himself said that he took a DNA test which came out with a percentage of each of the three so-called tribes in Rwanda. But history aside, there is no scientific evidence to support the assertion that the Rwanda Patriotic Front (RPF-Inkotanyi) is a Tutsi-led party or that Rwanda is a Tutsi-led government. The RPF has had Rwandans of all ethnic backgrounds in its leadership and membership from the day of its founding, the movement was founded on values of national unity, captured in it’s initially eight – now nine ideological pillars. Its official party anthem: ‘FPR Umuryango w’Abanyarwanda’ (RPF the Rwandan Family) and other songs of liberation, songs of morale in its then military wing the ‘Rwandan Patriotic Army’ (RPA) have all been explicitly unifying – much in contrast with the ‘anti-Tutsi anthems that characterized the genocidal regime. For all practical purposes, the RPF is a movement of national unity, which is consistently referred to as an ethnic political party by western experts. As far as we are concerned, all Tutsi were killed in a genocide which was perpetrated with that intent. Those who came back to Rwanda in its aftermath never said they were Tutsi, Hutu or Twa; they said they were Rwandans. If Tutsi were a 14% minority, how come after the genocide, Tutsi are still 14%? That figure, which is totally fantasist, has not been updated, perhaps downwards to mean there are now 0.1% following the genocide, or upwards to reflect mixed marriages or the new generation, etc. Who is Tutsi? Who is Hutu? Who knows? Who wants to know? And in any event, how can one know? There is law prohibiting ethnic profiling and facial profiling is scientifically flawed, but foreign ‘experts’ still pretend to have a way of knowing. There certainly are people today who would be qualified as such, but who wants to know and why? This is one preposterous debate. Major national findings and decisions, arrived at through scientific or legal processes are allocated to the person of Kagame. It is as thought the twelve million Rwandans count for nothing. A recent article in The Economist claimed that although the real number of victims of the Genocide is 800,000 people, ‘Kagame prefers a round figure of One Million’. 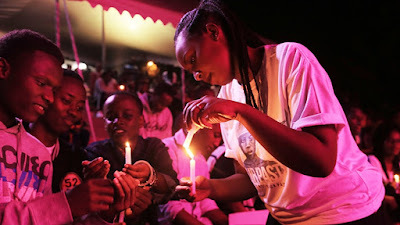 In reality, the Gacaca courts, which provided the most comprehensive and thorough census of who was killed, who killed them and in which circumstances they died, found that1,074,017 had been killed in the Genocide Perpetrated Against the Tutsi. No individual expert, institution – or politician – could have had the means to make such findings. The Gacaca had the entire nation participating in information gathering and sharing for ten years. To dismiss their findings and validate that of a few western experts is to say the least, racist. The arrogant dismissal of indigenous realities is precisely how the genocide ideology was planted among Rwandans. Some western people came and found a millennial civilization of a united nation and arbitrarily allocated to them origins and ethnic affiliations based on dubious criteria. There is no difference between these experts and their ancestors; the colonialists. Rwanda is not res nullius, nor is it a natural reserve where Tutsis and Hutus live in zones, separated on each side by a wall and insulated from interaction. It is a nation of human beings living together from time immemorial. Most of these self-appointed experts are profoundly ignorant charlatans who make a name by usurping African peoples’ agency. By the end of the Genocide in 1994, there was one television and one radio station; both state-owned. Twenty-five years later, reports haven’t factored in the advent of more than ten private television channels, more than 30 radio stations, an unknown number of websites, blogs, vlogs, Facebook, Twitter and Instagram accounts, etc. ; platforms that Rwandans massively use to interact, send both friendly and unfriendly messages to government and indeed complain on anything and everything just like all users of the internet on the planet. However, during the Genocide, media and political parties were used to call for mass killings of Tutsis. In the famous ‘Hate Media Case’ (Prosecutor v. Nahimana, Barayagwiza, and Ngeze, Case no. ICTR-99-52-T http://www.jstor.org/stable/4093416)The U.N. Tribunal found that mass media hate speech constitutes Genocide, Incitement to Genocide, and Crimes against Humanity. And that indeed “media of hate’ played a pivotal role in the Genocide against Tutsis. ‘The Rwandan government does not allow political dissent and opposition politicians are arrested on trumped-up charges’. Demagoguery as an efficient device for political fame is not strange to western societies, hence, there is no country in the world where everyone with a political opinion is accepted as a legitimate politician, and much less anyone who violates the laws of the land or promotes violence. Foreign experts’ understanding of political pluralism in Rwanda isn’t the classical agitation between, say Democrats and Republicans in the US; Les Republicain and La Republique En Marche in France, because such debate exists in Rwanda between the RPF, the Social Democrats (PSD), the Liberals (PL) or even with the Green Party; people who agree in broad lines, on how the society should be governed peacefully in a Republic. No, that is not what they mean; they would like the RPF to negotiate with FDLR, RNC or FDU, terrorist groups running military training camps in neighbouring countries, and with expressed agendas to use violence; groups that would like to turn up-side down our entire way of life, reintroduce ethnic politics, negate the Genocide or perpetrate a new one. So when they call for political pluralism in Rwanda, they simply mean the US negotiating with ISIS and Al-Qaeda, all in the name of democracy. Now, Rwandans take matters of divisionism seriously – for reasons that are rather obvious. It is not that they haven’t tried confrontational politics; it is that they are still paying the price of hate politics. So they collectively decided, through a referendum, to ban ethnic nomenclature in politics and seek solutions through ‘dialogue and consensus’. Who, regardless of their degrees, expertise or skin colour is qualified to dismiss such sacrosanct national ethos? What gives them such right? Kagame/the RPF liberated the country at gunpoint? That too is a fallacy, and here is why: How about the RPF liberated the country with open arms? With a rescue mission and humanitarian programmes? The RPF had a political wing and a military wing. Unlike western experts, the museum of liberation, testimonies of Genocide survivors or reports of the Gacaca courts do not depict a ‘single story’. While they acknowledge the arms struggle, they recount the humanity of soldiers and humanitarian nature of the RPF’s campaign, which saved lives and pardoned most of the killers. This assertion too is sophistry in the sense that it takes enthusiastic civic participation and political legitimacy as bad things rather than good ones. The question should be: how come western leaders are elected with 25% votes of 25% of the electorate, which represents only a quarter of the population? What led to such massive disenfranchisement? Why do western citizens not trust politicians to a point where they stay at home on Election Day? Is that something we Rwandans should aspire for? To have useless leaders who do not meet the aspirations of most of their citizens? Leaders who break records in disapproval ratings? How is that even democratic, since the majority of the population does not participate? But there are other arguments: why is it that in 2002, Jacques Chirac won the presidential elections in France with 82%? Does it mean that he rigged them? Did he coerce the French electorate? Or was it because the race’s outcome was so critical to the nation’s survival that people turned out to vote en masse? If you listen carefully; the Rwandan people, the French people, the British or American people have the same demands, the same need: they want security, they want decent livelihood, a roof over their heads, healthcare, they want to put food on the table, they want fairness and equity; they are just human beings. The difference is, Kagame gives the people what they want, while most western politicians feed them empty rhetoric while exploiting them to enrich themselves and their cronies. Finally, if President Kagame was such a bad leader, why was he chosen by his peers to lead reforms of the African Union – without ever campaigning for the role? And once there, why was he able to achieve such unprecedented results within such a short period of time at the continental body? ‘Mr Kagame now faces one test!’, ‘Two tests!’, ‘Three..’,experts frequently announce. My question is, who is putting him to test? Who has that mandate? Is it the Rwandan people or is it western experts? There seems to be a consistent failure among foreign experts to capture the Rwandan zeitgeist. As far as we are concerned, Rwanda is stable, peaceful and secure nation. Our President faces a million challenges on a daily basis, but there is no situation of do-or-die here. We know how we got here; we know where we go from here. And as Rwandan history has shown, every twenty-five or so years, we are capable of producing a Paul Kagame. This is Rwanda’s and Africa’s reality. Those less prejudiced who are alert to it are set to benefit from Africa’s upsurge. Those immodest soi-disant intellectuals, nostalgic of the colonial era, ‘dephasé’ (out-of-tune) and in love with their own grandiloquent treatises, will be obsolete. Asia and the rest of the world is moving on while they remain trapped into an alternative reality, left to sing the same song over and over again like a broken cassette tape. There is an entire western ‘bien pensance’ that’s infected by ‘intellectual schizophrenia’; in fact, they are paying the price in their own countries as we speak, where the ground has shifted from beneath their feet. As for us, we have seen these experts before. We have heard their ‘expertise’ every day for the last twenty five years. Our parents remember them too, so do our grandparents. From their hiding, Genocide survivors also heard similarpropaganda to theirson RTLM, and read it in Kangura - the media of hate. But let me end with a quick lesson on Rwanda’s governance: President Kagame is the head of the executive. In governing the country, he is assisted by a parliament and their decisions and that of the general public are subjected to the scrutiny of courts of law. This arrangement is called rule of law and checks and balances and it is enshrined in the national constitution, massively promulgated in a referendum by the Rwandan people. Presidential decrees do not regulate fundamental national matters, but only matters of the functioning of the executive. In other words, it is not the President who decided that we seek national solutions through dialogue and consensus, that there be an annual National Dialogue, a forum where all political parties meet regularly to iron out issues, or that genocide ideology be punished by the law. All these decisions were made by the Rwandan people. The President’s job is to oversee that the constitution is observed by the statutory institutions of the Republic. I am saying this because I am a lawyer and because I have petitioned courts to challenge government decisions, my colleagues frequently do so too. That a foreign journalist dismisses our institutions as primitive and isolates the President from the people he leads stems from a neo-colonial mindset. Indeed the Rwandan esoteric code has always existed and no one was above it_not even the King. It is recalled in Rwandan history, for instance, citizen-joe who once approached the Court of Cyilima to sue citizen-Rujugira [Cyilima II Rujugira, 1675-1708] _was the reigning king_and the submission was accepted. Alas, that system was disrupted by colonialism and tore the Rwandan nation apart – which later led to the Genocide against the Tutsi. Foreign experts are free to devise their dubious prophesies, on their own platforms. As we commemorate twenty-five years of the Genocide, we remain vigilant to these uninvited ‘experts’. Small stories thrown about here and there, which are taken in a broader context aim to saw hate among Rwandans, once again. So I am not aiming at changing the experts, because theirs aren’t honest mistakes; they know exactly what they are doing.What matters, and the reason I am writing this article, is to ensure that no Rwandan citizen, especially the younger generation, is infected with their poison. Note: I have not done these subjects justice because I did not want to confuse the reader, but mainly because my seniors; and I have published extensively on them.